That was a bug, it wasn't supposed to do that We fixed that (and other issues with dragging out of the screen) for the newer games. I hope this doesn't disappoint me. Anyway I wanna talk about something you may not expect: sound effects. In our quest to bring you the absolute best customization experience, we have yet again improved our clothing system for Papa’s Sushiria! As we worked on previous games, we’ve noticed several issues with the clothing system. Before, when you would shop for non-holiday clothing, you would first pick out a clothing style. From there, you could choose from a variety of colors for that style. We had lots of options to choose from for non-holiday clothes. However, the few clothing options we did have for holidays usually only came in 4 color combinations each. We also noticed that many players (us included) would only stick to holiday-specific clothing throughout the game to get the holiday tip bonuses. So in the end, everyone was stuck wearing the same limited holiday clothes as everyone else. This really went against the whole purpose of having a huge selection of clothing in the clothing shop. 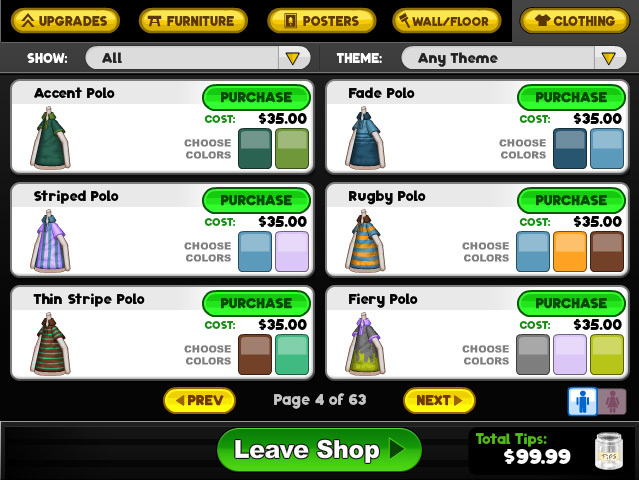 Now, when you go shopping for clothes, you can customize each and every style with whatever color combination you want! You can choose from a wide range of colors to customize the item just how you want it. You’ll also notice at the top of the color picker that it highlights the featured colors for the holiday. If you’re feeling festive, stick to these color options to get a greater tip bonus during that holiday. Or you can mix and match these holiday colors with other colors to get a little bonus without sacrificing your personal style. When you start choosing colors for your clothing, the Shop will add a holiday icon by the clothing item name to show which holiday that color scheme will work best on. This now makes every single item of clothing in the shop a potential holiday item! You can even take that Jack-O-Lantern shirt from Halloween, swap out the colors, and turn it into a spooky Valentine’s Day shirt! 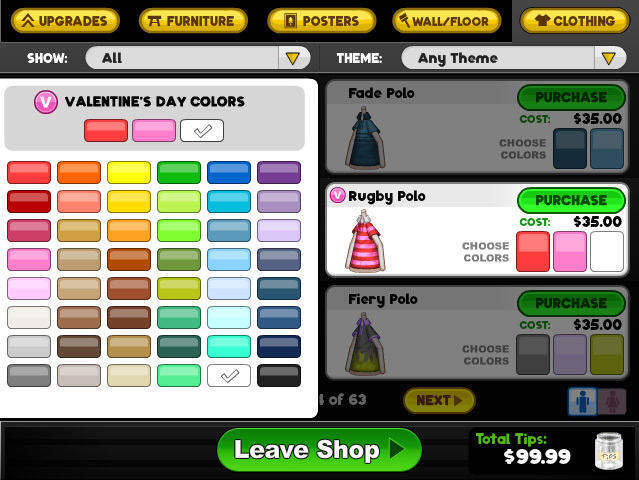 To help you find that perfect holiday outfit, we also make the shop’s default colors change with each holiday. So you can quickly and easily pick out some Valentine’s Day clothes if you’re pressed for time. 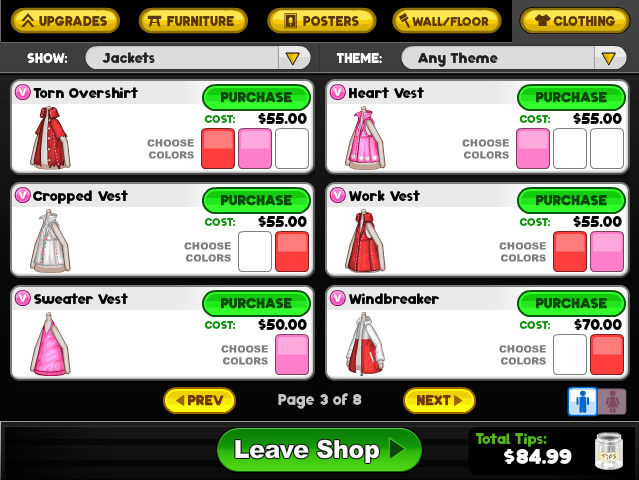 You can also change the “Theme” filter in the Shop to browse for clothing in other holidays. When you’re done shopping, you can change into your new clothes. You’ll notice a new “Holiday Spirit” meter at the bottom of the clothing screen. This will show just how much of a Holiday Tip Bonus you can expect based off of the colors and items in your wardrobe. You can mix and match clothing however you like, but wearing lots of the holiday colors or designs will boost your Holiday Spirit meter. Also, you’ll get a better boost to your Holiday Spirit if you’re using more than just one holiday color in your outfit: Wearing all white doesn’t seem very festive, but if you’re wearing white, red, and pink together… you’re ready to celebrate Valentine’s Day! You don’t always have to dress to the nines in holiday clothing if that’s not your thing. If you’re more interested in your unique look than in getting a huge tip bonus, you can just put on your red stripe shirt for Valentine’s Day, get a little extra coinage, and continue doing your thing. Easter is violet, lightblue and pink? New year black and um... Rainbow?